I’m ready for spring to arrive! It’s officially just a few days away. The plum trees are blooming with delicate pink blossoms and clusters of cheery daffodils are popping up around the neighborhood. Nature awakens to be fresh, new, and alive again! I’m celebrating spring by giving Sand & Sisal some new digs, a fresh and new blog design! Not only did I get a new design but I’m on a new format also, which is very foreign to me and with any new program, takes a while to learn how to use. So be patient with me for a bit as we work out the kinks. If you are having trouble viewing the blog at all, you will most likely have to clear you cache on your computer or phone. I apologize for any inconvenience it might cause. I’m happy with the new features this format allows me to bring to you, like providing printables, printable recipes, and a much easier commenting system. I want to give a shout out to my awesome graphic designer Lindsey of Chena Designs and my programmer Tony of Evenspar Solutions. They are two amazingly gifted, patient, and kind people! Thank you! 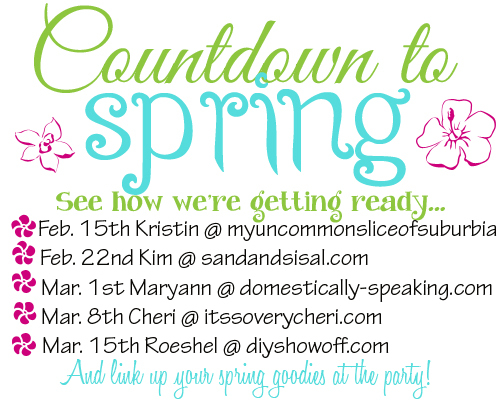 Today starts the last week of our Countdown to Spring Party and Roshel at DIY Showoff is hosting. 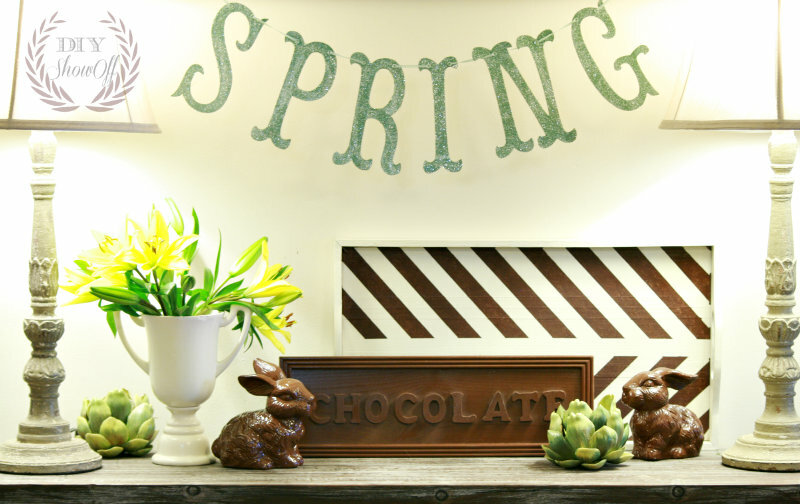 Roshel is sharing beautiful DIY Easter Decorating throughout her home. Hundreds of spring projects are also linked up for your inspiration. It has been fun collaborating with My Uncommon Slice of Suburbia, Domestically Speaking, It’s So Very Cheri, & DIY Showoff. Did you see their spring projects too? Check them out! Join me on FACEBOOKfollow, TWITTERfollow, PINTERESTfollow, G+follow or SUBSCRIBE. Love the new look Kim! Gorgeous! Thank you so much Katie. Change is always hard but I think this will be a good change! The new blog design looks great Kim! Congratulations!! Great new look, Kim!! I’m sure you’ll be a speedy pro in no time!